As I make the rounds of stationery and pencil blogs, I am discovering that there are differences between pencil users and pencil collectors. I am also belatedly discovering that, among the latter, there are many more kinds of collecting than I had ever imagined possible. The more I read, the more I am convinced that I will never qualify as a collector – I don’t understand buying pencils one will never use, and I also don’t understand collecting pencils as memorabilia – that is, buying them for the imprint more than the quality of wood or lead used. But this kind of collecting actually seems to be in the majority. One surprise I had upon browsing the classified section of the Pencil Pages (run by a member of the American Pencil Collectors Society, I think) was that there were a lot of people looking for Yikes! pencils. They were unfamiliar to me so I looked them up. Yikes pencils!! I mean, really? I am flabbergasted but on the other hand I kind of understand their sentimental appeal – but still, I’m not sure whether I would collect the kind of pencils I actually used during my middle and high school years, well first of all because they are hard to find now (more than the Yikes pencils I would say – everything in Korea seems to have a very short shelf life), and because, well, they look like this. The Mitsubishi pencils I wrote about last time were from my elementary school years; I have very few left from the period following that because I used mechanical pencils a lot more than pencils, and what pencils I had I used up pretty quickly. So the pencils I do have now are probably the ones I didn’t manage to get to till graduation, or possibly ones that I saved because they were precious for some reason. I don’t remember using any of the pencils pictured above, except for the Silvexa that is peeling so badly now – I think I was quite taken with it at some point. I also went through quite a lot of mark sheet pencils out of necessity – all exams were done on OMR sheets – and they were quite good, dark and smooth. (The Munhwa Deojons pictured above are a recent acquisition; they are manufactured in China now. I only have a stub of the Korean-made “for computers” B pencil left.) I regret not having had the chance to develop any youthful affection for Castell 9000s or Lumographs early on – they were simply not available then, although they are everywhere now. 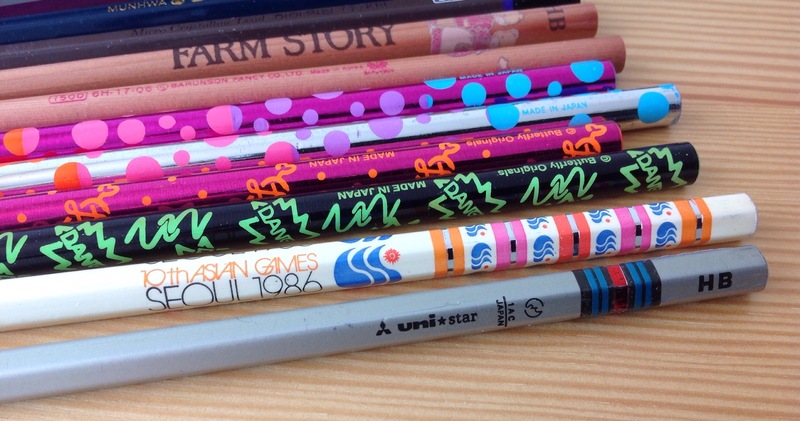 Japanese pencils were an exception; they were and still are widely available, especially Tombows. One interesting custom in Korea is that pencil boxes often carry the date of manufacture, so it is very easy to date them (if one can find old pencils at all, that is). 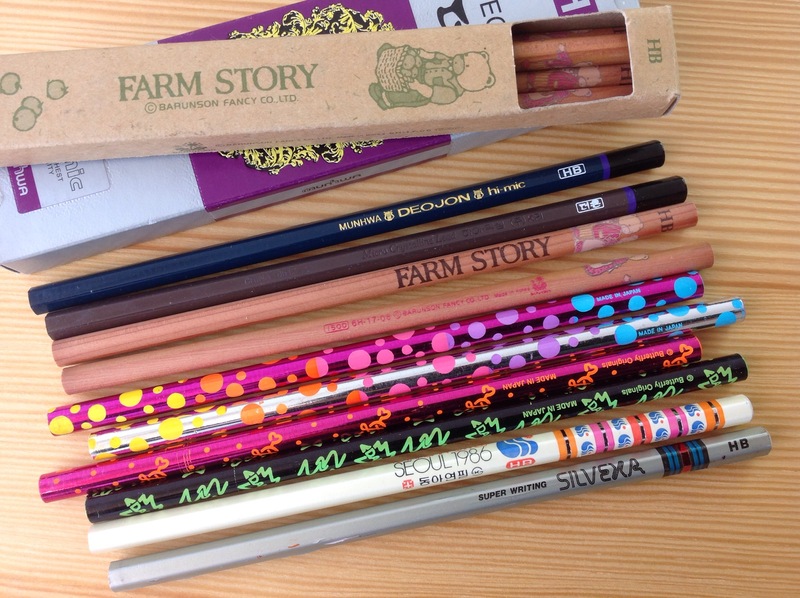 The “Farm Story” pencil was manufactured in December of 1986. By the way, if I were to collect fountain pens for sentimental reasons, I would start with the West German Super-Rotaxes. For some reason they were all over Korea in the mid-80’s, and I distinctly remember I had a turquoise one and another in a different color. The plastic body cracked eventually, but it was a very pretty pen and I really felt like a grownup using it. I wonder if anyone who grew up in Germany (or anywhere else, for that matter) remember them too?